I have been teaching for 10 years in Udavi. I teach from the 2nd grade to the 9th grade. For the youngest ones I start with simplified exercises, mudras, the Odissi basics (chouks and tribhangs) and games to make it fun for them. They sometimes work in smaller groups or improvise to music and free dance. They are full of energy and are very happy to learn. By the end of the 3rd grade the students start writing down the mudras and their meanings and information about Odissi as well as learning small dance pieces. For the 4th 5th and 6th grades they continue with basics and technique while learning dance items and choreographing and making their own dance pieces. I also ask them to invent and enact stories with mudras and navarasas (9 emotions). In the last grades, they deepen their understanding of the music, rhythm and emotions. Some are very talented and want to continue to become dancers or dance teachers. Over the years they have performed many times in Udavi and in Auroville with Auroville children. I present at least 6 annual school performances during the year with different groups, every time with different dance pieces and choreographies so that the students always have something new to learn or watch. We have also worked on a couple of bigger productions – Ramayan (2008) a dance drama mainly with the 10th std in Udavi who were my first group and danced (both boys and girls) till they left Udavi and afterwards too. 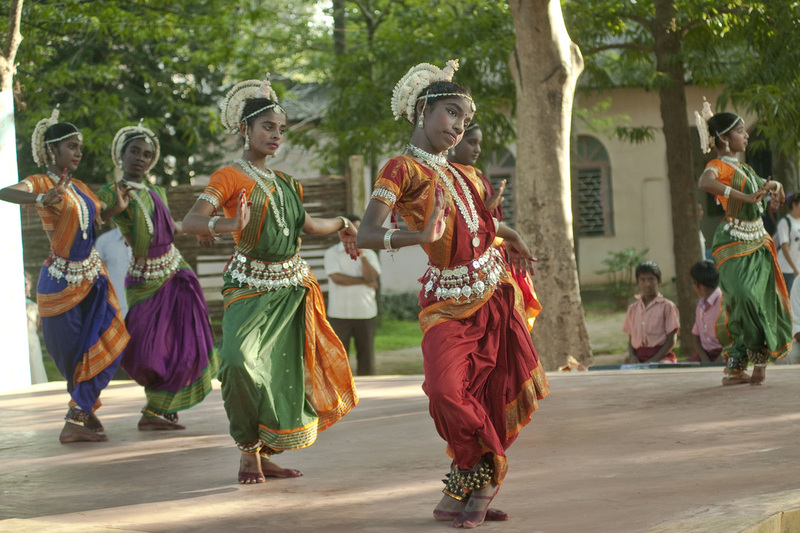 And Krishna under the Kadamba Tree (2011) – a dance performance with an interwoven story that involved students from different groups in Udavi, students from outside and students from Auroville of varying ages. The children are very simple but very talented – one can take them far. Some have so much within themselves but are afraid to express it. Also, the relationship between the students and the teachers is much closer and this helps the students follow their goals. Udavi allows me to express myself. Next year for the annual Dance Festival in January I am planning a dance drama with all my students – from Udavi, Auroville, outside and small kids. This project will bring together students from different schools of different ages to create something new.